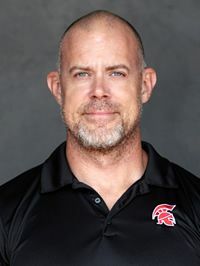 Jay Patterson began working at St. Stephen’s as head strength and conditioning coach and a football defensive and offensive line coach in 2011. In 2016, Patterson accepted the position of head varsity football coach while continuing to lead the strength and conditioning program. Patterson is an alumna of Jenks High School in Oklahoma, where he competed in football, basketball and track. Patterson was awarded Blue Chip All-American in football and competed in the Oklahoma 6A state track and field championships. Patterson attended the University of Tulsa on a full athletic scholarship to play football for the Golden Hurricanes. Patterson's passion for performance training began in 1990 when he worked for the Adams Course, a performance based strength and conditioning program focusing on high school athletes. Since then, Patterson has been training individual high school and collegiate athletes with the goal of unlocking their human potential progressively and safely. Patterson holds certifications as a High School Strength and Conditioning Coach, FMS (Functional Movement Screen), Olympic Lifts and youth specific certifications in speed development, fitness, and program design.